This week in science history saw, in 1952, the inventor Geoffrey Dummer present his idea of the integrated circuit, now an essential component of all modern computers, to the US Electronic Components Symposium. Although his attempts at building such a circuit failed and the first working examples were built by Kilby and Noyce in 1958, Dummer is known as 'the Prophet of the Integrated Circuit'. Dummer was born in 1909 in Yorkshire, England. He worked in electronics from the age of 22 and during the Second World War he worked for the Air Ministry Research Establishment, where he designed and installed over 70 types of radar training equipment. He also travelled to the United States and Canada to train men in the use of the radar equipment. He thought that many of the electrical components of the machines used for radar were not good enough and over the next decade or so explored techniques for creating more reliable circuits. A circuit for something like a computer is like a very complicated version of the circuit diagrams we learn about in physics at school. Components that carry out certain jobs are all connected together to give the properties necessary to, say, save a document to your computer or play a downloaded video on your mobile. Before the Integrated Circuit, all these components - transistors and resistors that act like tiny little switches - were soldered (sort of like gluing down with liquid metal that will conduct electricity) to circuit boards individually. Dummer suggested that a way to make circuits more efficient would be to use sheets of semiconducting material, like silicon. Now this is not to be confused with silicone that is found in breast implants. Silicon is a metalloid - found between the metals and non-metals on the periodic table, with some metallic and some non metallic properties. Pure silicon doesn't conduct electricity very well, so to vary its conductivity, a process called impurity doping is carried out, where ions of other elements like phosphorus and arsenic are introduced into the silicon. Before this doping though, the silicon itself must be exceptionally pure - with only one in 10 to the 10 atoms being non silicon. That's like one grain of sugar in ten buckets of sand. Depending on what element is introduced, the conductivity can be low or high, with different levels of conductivity needed in different parts of the circuit. 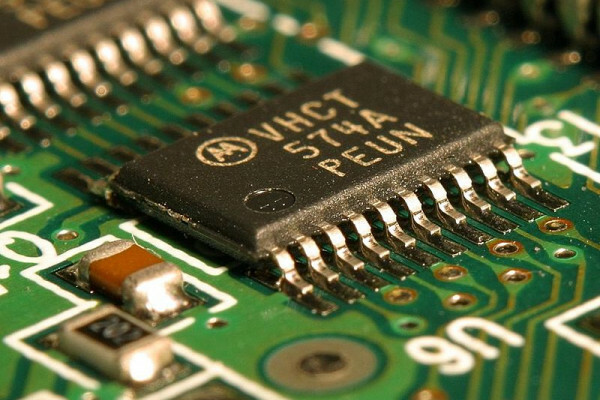 An Integrated Circuit allows miniaturization of the parts needed to make something like a computer work, hence the other name microchip. They can be as small as just a few millimetres square and have up to 1 million transistors per square millimetre. Their small size means that ICs are more efficient too - with less material used and much less distance for information and electricity to travel, reducing loss of information and reducing the amount of power needed. ICs are also cheaper to manufacture than discrete circuits as they can be mass produced - layers of differently conducting materials are printed onto the chips to create the circuit, just as Dummer had suggested, and then areas 'cut out' to reveal the different layers and change how they are connected together. The IC is part of what many academics believe is one of the greatest technological revolutions in the history of mankind - right up there with agriculture and industry - the digital revolution. The digital age we live in now is dependent on these circuits - laptops, the internet, mobile phones, iPods, handheld games consoles, everything like that. Dummer's presentation was the first step on the road to this revolution, giving us so many things that today we could not live without.